When the sun shines, and everyone is looking for relaxed summer eating, what could be easier and more delicious, than berry recipes which make the most of summer fruit. Berries are abundant across British and Irish food; from the earliest spring strawberries, through to autumnal sloes; it a pure symphony of color, taste, and texture. Most berries preserve well, either as a whole fruit or in compotes, jams, jellies or preserved in vinegar or alcohol, so summer sunshine is available throughout the year. 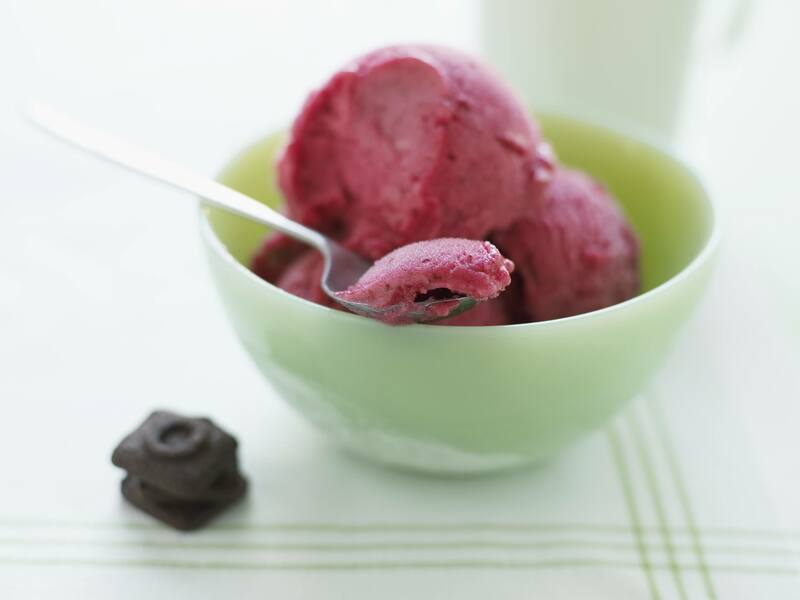 Make the most of delicious summer berries with a super, simple and delicious Berry Sorbet. The Berry Sorbet Recipe uses liquid glucose, available from supermarkets or a pharmacy; the liquid glucose helps prevent the sorbet from freezing into a hard, solid mass. Use any berry -blackberry, strawberry, raspberry or summer currants, blackcurrants are intense in flavor and make a particularly good sorbet. The choice is yours. When there is an abundance of summer berry fruits one of the best ways of serving them is in an English summer pudding, a dessert so quick, easy and delicious. All the fruit flavors of summer in one dish. Don't be fooled by this compote. It is delicious on its own but is also the basis for many more recipes. Gooseberry compote blended with a mix of custard and cream (or custard and yogurt for a slightly sharper flavor) becomes a luscious Gooseberry Fool. When topped with meringue and baked becomes a Gooseberry Snow and who can resist a buttery, sweet Gooseberry crumble with lashings of custard or cream. No list of summer berry recipes can be complete without an Eton Mess. The dish was traditionally served at Eton College but how it came to have the name is not clear. One story is a Labrador dog sat on a picnic basket in the back of a car and squashed a strawberry and meringue dessert. Scottish Cranachan is a very quick, easy recipe. It is also a very festive recipe and perfect for any celebration especially Christmas and Hogmanay, but it is also a super summer dessert, and so easy to make. Cranachan is especially good in the summer making the most of delicious Scottish raspberries for a truly authentic recipe but don't worry if you can't find Scottish, use any raspberries with the wonderful ingredients in the Cranachan it tastes good anyway. Yum, who doesn't love a dish of fresh strawberry jelly. Topped with cream, ice cream, even custard it is the easiest of easy summer foods. You may want to plan though, as the jelly takes a while to set but as it keeps for days in a refrigerator make it when you have the time. Trifle is the quintessential pudding that has graced British tables for centuries. A traditional British trifle is made using cake, sherry, home-made custard and fruit. Delicious. But you can make a quick, British trifle made using ready-made custard or custard made with custard powder.